This quick and easy recipe for Spicy Pickled Cucumbers will knock your socks off. And it was only one of many takeaways from my Chinese food tour. Do you know anyone who makes a home cooked meal from scratch that’s elaborate and incredibly delicious, almost every night? For a family of five no less?! 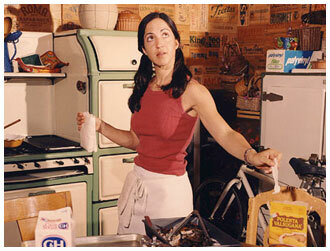 When I met my friend Rebecca a couple of years ago, I learned almost immediately that she was an excellent cook. I could never run into her without her saying she had to run home to check something on the stove, or that she was off to a specialty food market for a specific ingredient she couldn’t get anywhere else. Since meeting, Rebecca and I have gotten to know each other a lot better, and let me just tell you that this super mom of three, has a full day of dozens of other tasks she gets done, too. A few months ago, when I told Rebecca that I’d gone on a great food tour of Little India here in Los Angeles, she instantly offered to take me on a food tour of her favorite Chinese food spots in the San Gabriel Valley. First Rebecca took me for an unbelievable Tawianese breakfast at Si Hai Restaurant (Four Sea Restaurant in English.) We had several dishes, but what really stood out was a small hand pie called Ngau Yuk Sau Ban (that’s Beef Hand Pie in English). The Ngau Yuk Sau Ban is made with pickled vegetables and very thinly sliced marinated beef all wrapped into a super, flaky and light pastry — similar to puff pastry, only made with pork fat instead of butter. Sounds more like lunch, right? Frankly, I’d eat this hand pie anytime of the day any day! Rebecca, ordering our goodies at VP Tofu! Next, a quick stop at VP Tofu where Rebecca picked up a delicious dessert for her family, Do Fu Fa, which means soybean custard — it’s served with a lovely, light ginger syrup. I followed suit, of course! From VP Tofu, we headed to the Half & Half Tea House, where I got one of the most delicious, delightful beverages I’ve ever had — Coffee & Milk Tea with Boba! Boba, or “Bubble,” are the small, semi-sweet balls that fall to the bottom of the drink. These somewhat big, chewy balls are made from cassava, a type of sweet potato, rolled into black tapioca-like balls. These drinks are always served with an extra wide straw to accommodate these yummy treats! And treats they are! For our last stop we traveled to Arcadia to Din Tai Fun, where Rebecca ordered Juicy Pork Dumplings — hands down, the most delicious dumplings I’ve ever had. Ever! Each small dumpling was like having a bite of warm, comforting, hearty soup. To complement the dumplings, Rebecca also ordered a wonderful dish of Spicy Pickled Cucumbers, which was a highlight that I’ve recreated for you today! While I’m guessing this is not quite the way Din Tai Fun prepares their cucumbers, I think I’ve come pretty close! This was a most memorable food day with a very sweet friend! And of course, if I were you, I’d get started on these Spicy Pickled Cucumbers. Add them to your weekend recipes — or use them as a yummy side dish! This quick and easy recipe for Spicy Pickled Cucumbers will knock your socks off. It's refreshing, spicy and crunchy, all at once. Cut the cucumbers into approximately 1/2-inch rounds and place them in a mixing bowl. Sprinkle the cucumbers with the salt and gently mix. Let them site for about 20 minutes. Pour the salted cucumbers into a strainer and drain and rinse them with cold water. Dry them with paper towels and place them in a new mixing bowl. Set aside. In a small sauté pan, over low heat, warm the sugar with the vinegar only until the sugar has dissolved, about 2 minutes. You can stir it a bit as it warms. Pour this over the cucumbers and gently mix. Let them marinate in the refrigerator for about 2 hours. You can use the same small sauté pan to heat the oil with the chili paste. Cook only until it's sizzling, about 2 minutes. Let this cool to room temperature. Remove the marinating cucumbers from the refrigerator and drain almost, but not quite all of the liquid. Carefully stir in the chili oil and serve. I am way on the other side of the continent but loved the stroll you took me through. I should search Charlotte for some of these dishes. Valentina. Once again you have made my day. Several years ago my husband was told to visit a noodle restaurant in Arcadia. We loved it, but forgot to write down the name. Din Ta Fun was a memorable meal, and now we can return. Many Thanks!! These cucumbers look delicious! Love the presentation too. Is there a good way to get them thinner? I love my pickled cucumbers to be pretty thin when it comes to the end product. Thank you for sharing your recipe! Hi! You could use a mandoline to make super thin slices. Hope you try it. Enjoy! Hi at the sugar and vinegar stage it become really hard in the sauté pan after i let the sugar dissolve. Am i not wAiting long enough. Hope to hear from you soon! This is a fantastic recipe – thank you! My only variation was adding a few drops of sesame oil to the chili oil as it was “cooking”. This is a very good post. Thanks for sharing. Keep posting.